I remember the day when first time I ate this fried food, labeled Chicken Nuggets. It was amazingly delicious and has a distinct taste and texture than the regular Chicken Nuggets. These chicken nuggets are not prepared with chicken mince instead small chicken cubes are used for preparation. On the next day I decided to make chicken nuggets at home. So I thought what things would use to fix chicken cubes; I used egg and corn flour for that purpose. With a little effort I was successful to make right shape and to set chicken pieces. When the nuggets were ready, they were very similar to the taste I ate from bakery. 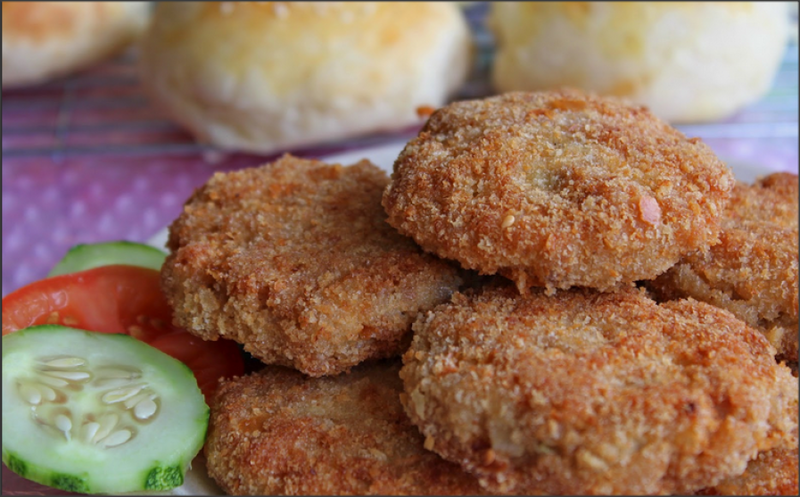 Here, I am sharing my own recipe with you and I give it name Chicken Nuggets Kebab due to round shape. Cut chicken breast in small cubes. Take chicken in a bowl and marinade with salt, black pepper, red chili powder, dry coriander powder, vinegar, corn flour and half egg. Now carefully coat in bread crumbs and place all nuggets in a try. Refrigerate 20 minutes to set kebab. Take out from refrigerate and dip in egg and again coat bread crumbs. Keep a side for more 5 minutes. Heat up oil in a frying pan and shallow fry Chicken Nuggets Kebab on slow flame from both sides nearly 7-8 minutes. Set Chicken Nuggets Kebab on bed of salad leaves and serve with ketchup.